Fleetwood Metal Body was an automobile coachbuilder formed on April 1, 1909. 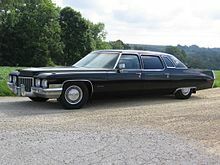 Its name derives from Fleetwood, Pennsylvania, home of the company at the start, and lived on for decades in the form of the Cadillac Fleetwood and various Fleetwood trim lines on Cadillac cars. The Fleetwood PA facility is located at 69 South Franklin Street. The business was relocated to Detroit in 1931 but the structure remains. It was a top-tier producer of metal and wood automobile bodies. Fleetwood bodies graced cars owned by Royalty of India and Japan, American presidents, and screen stars like Rudolph Valentino. 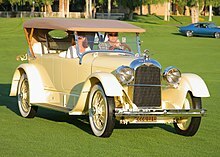 Fleetwood produced bodies on chassis from Bentley, Cadillac, Daniels, Duesenberg, Fiat, Isotta Fraschini, Lincoln, Mercedes-Benz, Packard, Pierce-Arrow, Rolls Royce, SGV, and Stutz. Bodies were manufactured according to the customers specifications, then sent by rail to the rolling chassis manufacturer where assembly was completed. Most of the bodywork crafted in Pennsylvania was used by Packard, with the rest of production being used by both Cadillac and Lincoln. Fleetwood was purchased by Fisher Body in 1925, and became an OEM provider of bodies for Detroit Assembly on Clark Street, and integrated into General Motors in 1931. The factory in Delray, Michigan, approximately 2 miles east of the Ford River Rouge Complex; Fisher Freeway named for the original factory location later became to be known as Fisher Plant #18. The location was closed in 1987 when manufacturing was transferred to the Detroit/Hamtramck Assembly factory, and the site was redeveloped as the Container Port Group Detroit facility. 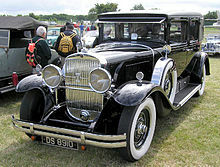 Similar to LeBaron, Fleetwood continued to build bespoke bodies for several years, mainly for Cadillac. In the early 1930s Fleetwood bodied Cadillacs often wore a sweep panel across cowl and hood. After 1934 and before Fleetwood was made a model name of Cadillac, it was responsible for elaborate detailing on expensive Cadillacs with standard bodies. Wikimedia Commons has media related to Fleetwood Metal Body. Wikimedia Commons has media related to Cadillac Fleetwood.